There is a UL Classification document for each of our UNIQUE Fire Stop Systems applications. Click on any link below to view the UL ratings. The Hourly Fire Resistance Ratings listed are F Ratings. Some of our systems also have T and L Ratings. Scroll to the bottom of the page to see the definitions for each UL rating type. * These systems are limited to 2 hour rated horizontal installations. Our systems come with enough Unique Putty for a minimum 25% and maximum of 48% cable load. Listings with 3-M, Hilti, Rectorseal and Nelsons all require a minimum of 1 inch of mineral wool batt insulation, packed tightly, into both ends of the sleeve and recessed for the amount of sealant to be used. The wool batt acts as a backing for the intumescent sealant that is used to seal both ends of the sleeve. Mineral wool batt insulation is a common fireproof material used to insulate hot water heaters, fireplace inserts, and heating ducts. The best source for this packing material are the local commercial insulators in your area. Most distributors stock it as well. Note that some old-timers may call it rock wool. Our vertical and 4 hr. Systems do require this packing. All of our sleeve systems require the use of an intumescent caulk or putty to seal both ends of the sleeve. This material expands in the presence of heat / flame, suppressing the spread of a fire through the sleeve system penetration. The way a sleeve is packed and sealed are directly proportional to the amount of time a system will suppress a fire. For example, a 1 inch thickness of intumescent putty may be sufficient for a 1 or 2 hour rated penetration but a 3 or 4 hour application might require a 2 (or more) inch thickness in the ends of a sleeve system. Several fill material manufacturers have developed, tested, or engineered through penetration systems combining our sleeves and their fill material. All of our systems have our UNIQUE Intumescent Putty included with the sleeve. Select the UL Listing to match or exceed the barrier. 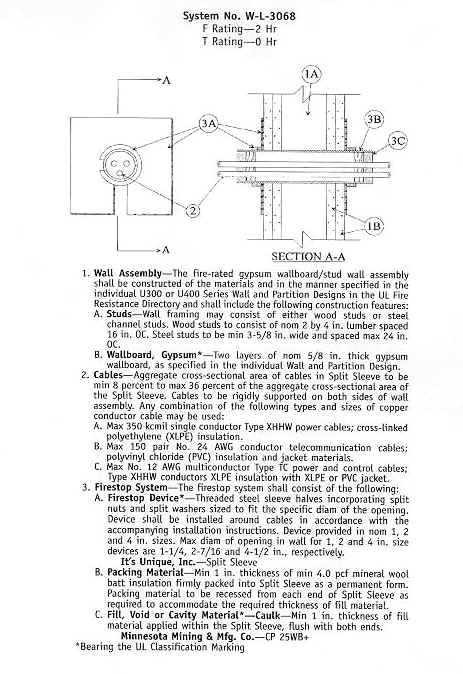 Pay attention to cable loads and fill procedure in the Listing. Go to the Cable Load Chart link. 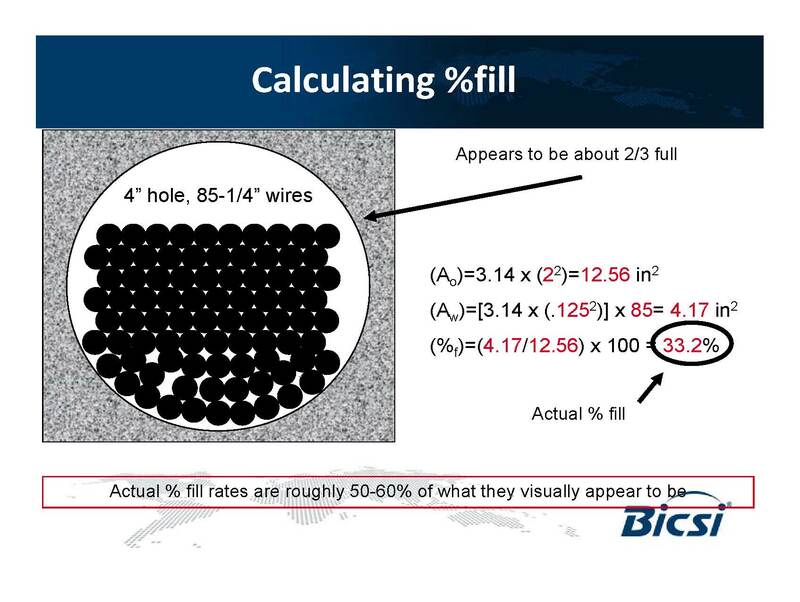 Select the proper size Sleeve, based on the % cable fill load permitted in the U.L. Listing. Seek pre-approval from the Authority Having Jurisdiction (Inspector). Remember, it is approved, if the Inspector says it is! 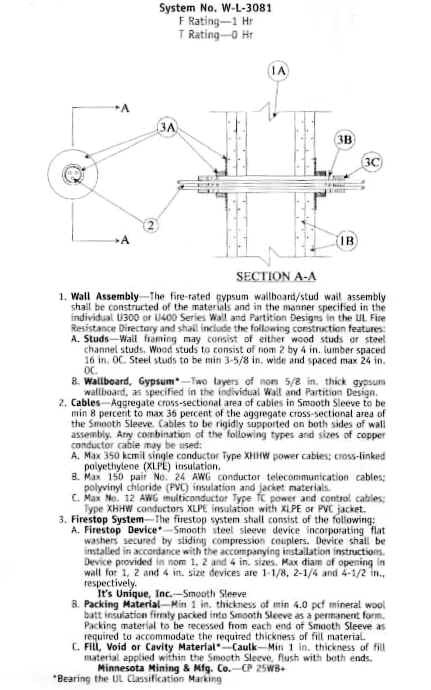 When installing the System, be sure not to exceed the listing limitations. Read the listing. After installation, fill out the label and take a picture to document the System for future reference. If you follow the steps listed above, you will guarantee AHJ acceptance. Water: The “W” rating, established in 2004, indicates the fire-stopping material has passed the UL test for water tightness. The Class One requirements for water tightness include subjecting the material to a 3-foot water column for 72 hours, followed by a fire and hose stream test, conducted in accordance with ANSI/UL 1479. A Class Two listing requires the material to be resistant to a 20-foot water pressure head. 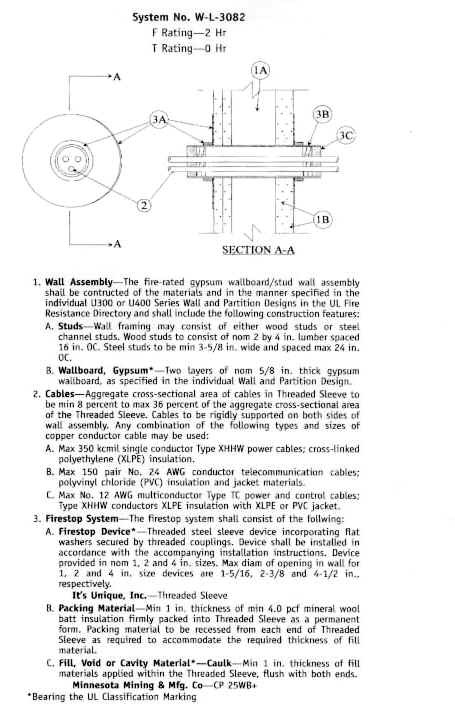 Finally, a Class Three listing requires the material to be resistant to 57.54-foot water pressure head. 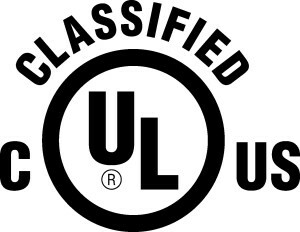 According to one of its spokesmen, UL developed the new “W” rating to prevent water damage and mold-friendly moisture associated with through penetrations.